Capitalizing on more than 15 years of experience in rural Vietnam, the Learning Clubs for Women and Infants innovation aims to pioneer a low-cost initiative addressing all eight risks to optimal early childhood brain development through a structured, universal program combining information, learning activities and social support with groups of women at the same life stage. The program comprises of five modules with 24 sessions that involve 1) facilitated small group discussions with visual material aids and 2) follow up home-visits to understand the progress made by women and to provide additional support if needed. The educational package includes a DVD with instructions for skills formation, together with posters and take-home leaflets. 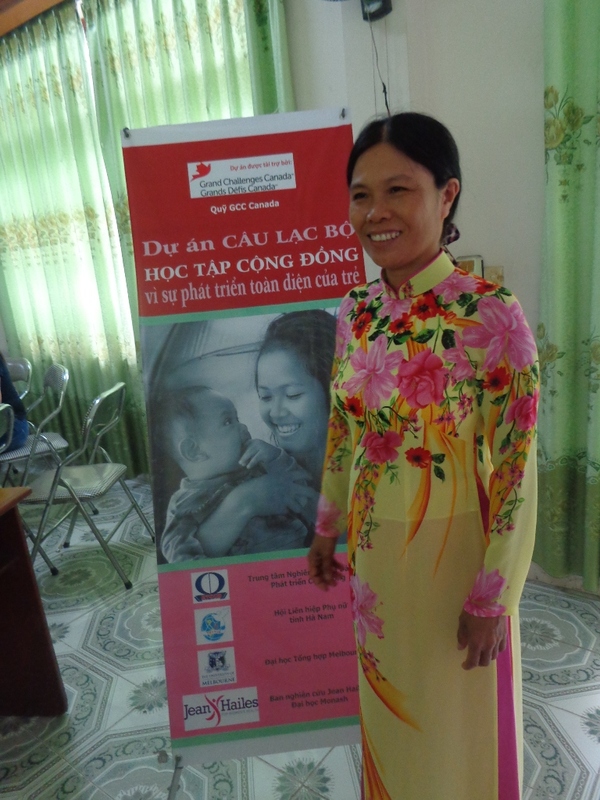 The contents have been developed from the international standard packages such as the Care for Child Development by WHO and UNICEF, Thinking Healthy Program, Pregnancy Childbirth Postpartum and Newborn Care – A guide for essential practice by WHO, Mental Health-GAP Instruction Guide by WHO, Integrated Management of Child Illness by WHO, Vietnam’s national nutrition program, and the national child injury prevention program. The Learning Clubs are facilitated by the Women’s Union staff (community-based lady social workers) and Commune Health Clinic staff (community-based medical doctor or nurses) who are trained in six courses to deliver the program. The first five courses taught the program content and focused on how to facilitate the modules. The last course provided training about Learning Club operation, monitoring and supervision. Learning Clubs are organized at the community meeting hall and the community health clinic site. DVD players are provided by the local authorities. Laptop and projectors are provided by the project. Facilitators use the DVD as a means to teach skills, instruct the practice of new skills on dolls and on children directly, facilitate the discussions after practice and provide take-home messages. Each session lasts for about 90 to 120 minutes. After the class session, facilitators visit households to see how women adopt the new skills at home and provide additional support until new skills become habits. Women with mental disorders, sick children, difficult toddlers, or poor skills in personal and child care, and women who suffer from domestic violence, extreme financial hardship, or family crises, will be prioritized to receive a home visit. Each facilitator will conduct 2 home visits per month. 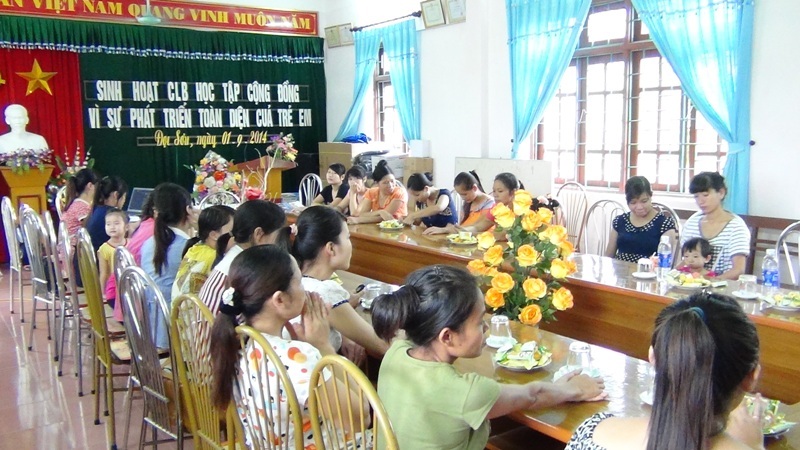 From 2014-2015 the project will focus on producing a low-cost, easily understood, structured curriculum for the Learning Clubs to be operated by the Community Women's Union with evidence from field and pilot testing the project in three rural communes randomly selected in Ha nam province. By the end of 2015, the five modules, the manuals and materials, and the Learning Clubs Operation manual will be ready for scale. The draft innovation structure was consulted with Department of Health and Women’s Union and endorsed by local authority. Obtaining permission to translate and use the standard assessment tool (Bayley, ASQ) took time and prolonged the project preparation. During the implementation of this project, the resources from the innovation will be shared with NGOs in Vietnam to anticipate scale up. In addition, the innovation and the resources will be shared with the Ministry of Health’s Department of Maternal and Child Health for endorsement and usage for national-scale projects/programs. The project will apply the baseline and final assessment in both control and intervention sites. The baseline and final evaluation will be conducted in six communes (three intervention communities and 3 control communities). Assessment will be carried out in four target groups: (1) pregnant women; (2) families with children 0-6 months; (3) families with children 7-12 months and (4) families with children 13-24 months. Assessment measures will include the Ages and Stages Questionnaire, HOME inventory, Depression Anxiety Stress Scale (DASS-21) anthropometry, and socio-economic status section. After each module completion, a small survey conducted by an independent team (Provincial Center for Preventive Medicine) will be carried out to measure the behavior changes in parents who attended the Learning Clubs, identify barriers for the behavior changes and generate suggestions for improvement. Together with the assessment survey, the project will use a computer-based monitoring system where the rate of participation in Learning Club Sessions, number of home visits, and problems and recommendation for changes are recorded and emailed to district/province Women’s Union and the project management team. The monitoring outputs will provide additional background to explain the project results and figures. The project will record the detailed and separated costs for (1) material development, review and approval; (2) capacity building – training courses; (3) learning club operation; (4) supervision; (5) dissemination and advocacy. The financial recording system will ensure the project team to identify the needed costs for the scaling-up phase. A cost analysis to understand the cost effectiveness of the program will be conducted during the second phase of the innovation. Ministry of Health. (2014) Infant mortality in Vietnam and causes. Vietnam. Tran T et al. (2014) Infant motor development in rural Vietnam and intrauterine exposures to anaemia, iron deficiency and common mental disorders: a prospective community-based study. BMC Pregnancy and Childbirth, 14(1):8. Tran T et al. (2014) Perinatal common mental disorders among women and the social and emotional development of their infants in rural Vietnam. Journal of Affective Disorders, 01/2014. Hanieh S et al. (2013) The Effect of Intermittent Antenatal Iron Supplementation on Maternal and Infant Outcomes in Rural Viet Nam: A Cluster Randomised Trial. PLoS medicine, 10(6): p. e1001470. Hanieh S et al. (2014) Maternal Vitamin D Status and Infant Outcomes in Rural Vietnam: A Prospective Cohort Study. PLoS ONE,9(6):e99005. Walker S et al. (2011) Inequality in early childhood: risk and protective factors for early child development. The Lancet, 378(9799),1325-1338. Engle PL et al. (2011) Strategies for reducing inequalities and improving developmental outcomes for young children in low-income and middle-income countries. The Lancet, 378(9799), 1339-1353. "Chief executive organization Grand Challenges Canada ( GCC ) to field with RTCCD on 23/08/2013"
I don't see Manual 5? Co-designed, community-led Women Circles nurture the innate strength of women and communities through a series of group activities that promote wellbeing, reduce stress, strengthen relationships, and support women in becoming agents of change.